You own a sailboat and require work on your sail. It’s time to visit your sailmaker! Perhaps you are unsure what to expect. While different sailmakers may have different policies and procedures, in general you should find the following information helpful to get you more acquainted with the process and feel more comfortable asking the right questions. 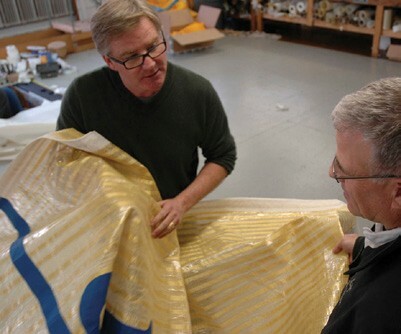 UK Sailmakers New York loft president Dave Coughlin (left) discusses sailcloth with Tom D’Albora of Dimension-Polyant. Let’s assume that you have a mainsail that needs repair. You can ask friends with sailboats who their sailmaker is. A recommendation from a fellow sailboat owner or marina operator is generally a good way to find a reputable professional who will service your sails with care and provide expert knowledge, both for your sails and your boat in general. You can also search the Internet for information. A phone call or an email to a sailmaker can begin your relationship. Let the sailmaker know the type of boat you have and the year it was built. It’s also a good idea to indicate if you primarily use your boat for racing or cruising. You may indicate if someone recommended you to the sailmaker and, of course, the reason why you are calling. This information gives the sailmaker a frame of reference for your call and allows him/her to provide better feedback. You might want to ask questions about the cost of the repair and how long it will take to do the work, although it may be difficult for the sailmaker to answer these questions without seeing the sail in need of repair. A picture can be worth a thousand words, so you might want to send photos in an email. Even so, it may still be difficult to provide definitive answers until the sail is actually inspected at the sailmaker’s loft. The loft, as it is known, is the large open space used by the sailmaker to spread out the sails. At this point, the sailmaker will recommend the best course of action to address your need. The following are the most typical methods of getting a sail to a sailmaker. You can schedule an appointment to drop the sail off at the loft during normal business hours. If you have prearranged for this time with the sailmaker, you may have the opportunity to be given a tour of the loft. This will help to demystify the loft further and provide you with a better sense of the sailmaker’s role in helping to maintain your sails. However, it may not be possible to open up your sail on the loft floor and inspect it with you at the time of your visit. If you are not able to meet during business hours, the sailmaker may have a location for you to leave the sail in a safe, pre-designated location. In this case, you should ask whether your sail should have a tag attached to the sail with specific identification information prior to the drop-off, or whether there are instructions and material at the drop-off location to provide this information. It is important to have identification on the sail; at a minimum are your name, contact information, type of sail, type of boat and the timeframe in which you need your sail back. The location may be at the sailmaker’s loft or there may be a drop box at your marina where you can leave the sail for pickup. You should ask if there is a charge for the pick up if the location is other than the sailmaker’s loft. Again, ensure the sail is marked with your information. Additionally, if a sailmaker is not within driving distance, you can ship the sail to the loft. You may be responsible for the cost of shipping the sail. The sail will be inspected on the loft floor. Generally speaking, depending on the size of the sail, it takes two people 15 minutes each (one half hour in total) to inspect a sail thoroughly. A sailmaker will look the sail over carefully, not only for the items you have identified, but the entire sail. 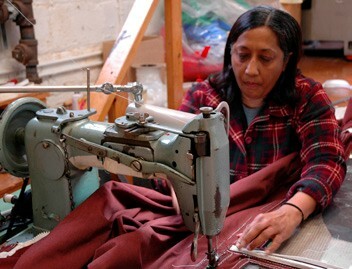 This is part of the sailmaker’s responsibility, since you may not have noticed other areas in need of repair. Information about the sail’s condition is documented and a determination of the repair options is made. Contact will be made to provide you with feedback and possible courses of action for your sail, as well as an estimate of price and time to perform the work. If, in the sailmaker’s professional opinion, your sail is not worth repairing, that information will also be provided. Unfortunately that sometimes happens. The sailmaker can provide you with a quote for a new sail. Ultimately it’s your decision on the course of action the sailmaker should take on your sail. You may decide you don’t want any work done. In this case, you will probably be billed for the inspection time and, if applicable, the pickup or shipping fees. Estimates are given based on the time and material necessary to compete the work. Hourly rates depend on the location of the loft and how much competition there is for business. You should expect to pay anywhere between $70 and $100 per hour. If the work is to be performed on a “rush” basis, there could be an “upcharge” to accommodate your overnight or peak season request. You should ask questions to ensure you are comfortable with the decision you are making. Your sailmaker will probably be able to tell you the likely causes for the issue you are having with the sail, if you don’t already know. It may be possible to prevent the issue from happening again with an adjustment to the boat or the sail. You should expect that the agreed upon work is performed in a professional and timely manner as agreed to based on your needs and the loft’s capacity. The sailmaker may require a deposit payment for the work to be done, or may invoice you in full when the work is completed. Prompt payment is always appreciated. Depending on the loft and your need, the sail may be returned to you immediately upon completion of the work or at some time in the future. Most lofts have some capacity to store your sail if you need that service. You may or may not be charged for this service – you should ask. If your sail is to be returned, delivery or pickup arrangements may be made. Finally, your sailmaker is a trusted advisor who is ready to help you. Establishing a good relationship will make owning your sailboat a more pleasurable experience and provide you with valuable information to help protect the investment in your sails. Your sailmaker may also be able to work on your boat’s canvas, so you might want to inquire about that and any other services the sailmaker can provide. P.W. Siebecker is the Managing Member & Chief Financial Officer at UK Sailmakers, LLC New York in City Island, NY.